This uncommon and intriguing name is of Old French origin, introduced into England after the Norman Conquest of 1066, and has two possible interpretations, each with its own derivation. 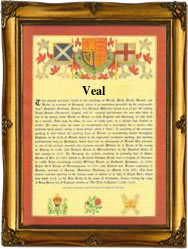 Firstly, the surname Veal may have developed from a nickname for an old man, or for the elder of two bearers of the same given name, derived from the Anglo-Norman French "viel", old, from the Old French "vieil". Secondly, the surname may have been a metonymic occupational name for someone who tended calves, a calf-herd, or possibly a nickname for a particularly docile, placid person; the derivation in this instance is from the Anglo-Norman French "ve(e)l", calf, from the Old French "veel". The modern surname forms, from both sources, are Veal(e), Veall and Veel, and early examples include: Geoffrey Viele (1206, Sussex); William le Viel (1218, Lincolnshire); Richard le Vele (1270, Somerset); and Thomas le Veel (1296, Sussex). Among the recordings of the name in London Church Registers are the christening of Thomas, son of Hugh Veal, at St. Mary Woolnoth, on November 5th 1570, and the marriage of John Veal and Alice Thornton on May 1st 1637, at St. Michael Bassishaw. The first recorded spelling of the family name is shown to be that of Reginald Leviel, which was dated 1173, in the "Pipe Rolls of London", during the reign of King Henry 11, known as "The Builder of Churches", 1154 - 1189. Surnames became necessary when governments introduced personal taxation. In England this was known as Poll Tax. Throughout the centuries, surnames in every country have continued to "develop" often leading to astonishing variants of the original spelling.